2 of 5 In small bowl, whisk together balsamic vinegar, garlic, basil, salt and pepper. Slowly whisk in olive oil; set aside. Place romaine in a large serving bowl. 3 of 5 Place peppers on grill and cover; grill for about 6 to 7 minutes per side or until skin is starting to turn black. Remove from grill and cut into 1/2-inch pieces; add to romaine in bowl. 4 of 5 Grill corn 10 minutes, turning, or until tender and beginning to brown. Remove corn from grill. 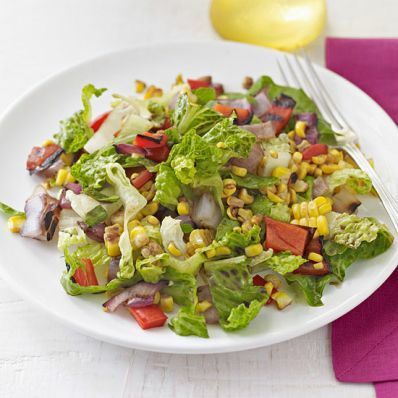 Cut kernels from cob; add corn to romaine. Starting at root end, cut red onion into 1/2-inch-thick slices and secure with toothpicks to keep rings from separating. Grill slices 5 minutes per side, turning once. Remove and cut into 1/2-inch pieces; add to romaine mixture. 5 of 5 Toss salad with prepared dressing and serve immediately. Per Serving: 4 g fiber, 21 g carb., 10 g Fat, total, 0 mg chol., 100 mg sodium, 1 g sat. fat, 172 kcal cal., 4 g pro.